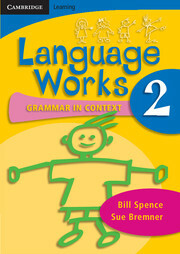 Language works: Grammar in context is a series of workbooks for students from Years 1 to 6. Each book consists of 28 to 30 units per year, based on 10 weeks/term including long weekends, and school testing requirements. Each unit focuses on a specific grammatical concept, and units will run in the same order in all books. Grammar features will be consistent in all years so that teachers of multi-age or multi-ability groupings can cover the same grammatical concept with all students at the same time.